I usually describe really exceptional food as "inspiring", but the word just doesn't satisfy in this situation. This sushi went beyond that. I've decided it was life changing. I was giddy throughout the entire 3 hours I sat here eating. My friend and I took our time and managed to talk and eat long enough to see 3 seating changes on either side of us at the bar. Yes, it was probably annoying to the sushi chefs and the hostess, but no one ever rushed us, and the server kept changing our green teas (not just pouring refills), to make sure we had hot tea at all times. My friend and I both had the omakase/tasting menu. It starts at around $80 for 10 pieces and goes upward to over $100 depending on how many pieces you decide to get. The chef makes the sushi and gives it to you one at a time. You're told to tell him when you've had enough. I couldn't decide if I was full or not for a while because of all the long pauses in between each bite. 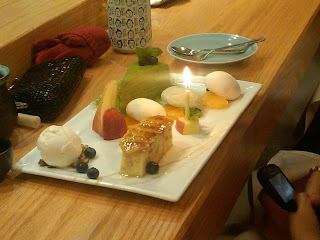 The chef was really good about peering over the bar to see if we had eaten the pieces yet, so the pauses were mostly because I was taking photos/talking/singing along to the 2 birthday celebrations. The birthday celebrations were so cute! The servers dimmed the lights each time and brought out a dessert plate and played the birthday song music on the speakers. It was adorable. The whole restaurant would clap, too. The restaurant was cozy and unpretentious. If it wasn't for the sushi bar, you really wouldn't guess it was a Japanese restaurant. The carpeting, red banquettes and tables were all very nondescript. My friend said that this sushi tasted a bit like a salad because of the pieces of vegetable and olive oil on top of the fish. Tiny pieces of bell peppers with shrimp. Tofu puree on tuna. The tuna literally melts in your mouth. Black cod with a smokey flavor. Quite a few pieces of fish had hints smokey-ness. Really interesting! There was jalapeno oil on this. A little spicy and SO good. One of my favorites. Slice of fried tomato on fish. Pieces of eel on avocado. The eel was still hot. This combo was superb. Another favorite. Pieces of dry mushroom on fish. Uni oh uni... The uni was was sitting in the case right in front of me, so I'd been eyeing it since I sat down. I was so excited when it ended up on my plate. Raw beef. I didn't hear the sushi chef say what this was and thus got a little confused when I took a bite of what I thought was tuna. 冬瓜/winter melon on foie gras! Amazing combo. The foie gras piece was quite generous. I was pretty much ready to marry the chef at this point. We finally decided we'd have one last sushi. This had grilled onions on it. Vanilla Crepe Cake. Sweet, light and delicious. Mochi. Strawberry, vanilla, green tea. The couple next to us celebrated a birthday and I snuck a picture of the dessert plate. 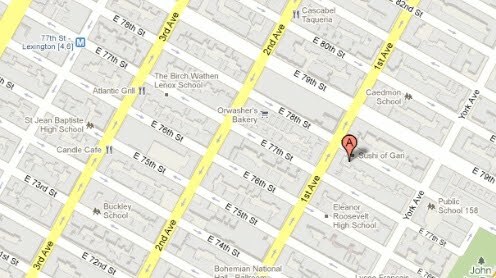 There is are two other locations, one in the theater district and also in the upper west side. 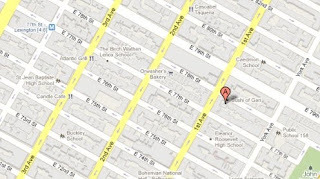 My friend has tried the 46th street Sushi of Gari and insists that the 78th street one is better. It's the original location that opened in 1997.